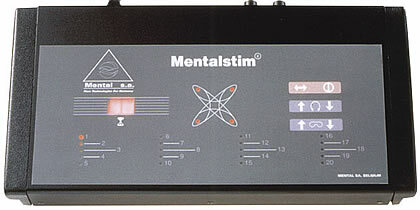 Mentalstim is an audiovisual stimulator designed for healthcare professionals. This model is also used in operating rooms and sleep laboratories. 20 pre-programmed recordings with digital play time display and rewind function. Fifteen different pleasant and effective sounds with volume control. Ultra-light glasses with intensity control. Easy to use and automatic mode (two buttons). Connects to a microphone (with volume control). Connects to an Alpha brain biofeedback device. Can be used with two sets of glasses and two headsets (+ one control headset for the therapist). Can be connected to an amplifier for 20 people.